Please enter the personalization desired. Letters, numbers, and red heart beads available. 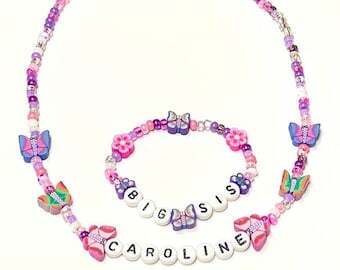 Personalized Necklace & Bracelet Set. Pretty Easter Jewelry for little girls. YOU CHOOSE the pearl color and charm. Pearl Necklace is 16" un-stretched and will easily stretch up to 22" for easy on off by your little girl all by herself. It's double strung for added strength. Under normal use, my jewelry is very durable and will last a long time. Pink, Peach, Lt. Yellow, White, Lavender, Lt Blue, Mint Green, Ivory and a mix. Charm Choice: please see last pic. Our standard free packaging is an organza drawstring bag and sparkly tissue paper. So Cute! A light weight, strong, stretchy jewelry for your child. Made to spell out his or her name, sport, or nickname of choice. Accented with beads. Bead color or dye lot may vary slightly from the ones shown. 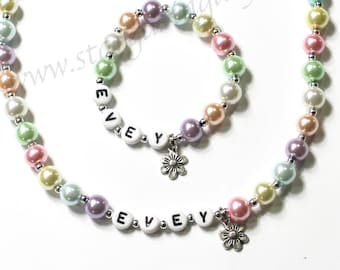 This listing is for ONE bracelet/necklace set. Photos shown here are examples. If you want more than one set personalized please purchase one item for each. You will automatically receive a shipping discount as long as you checkout and pay all at once. Additional savings on orders over 10. Convo me for more information. Contains small parts. Use caution when giving to young children. Ages 3 and up. One gift wrapped jewelry box with tag. Need more than one? Message me for pricing. 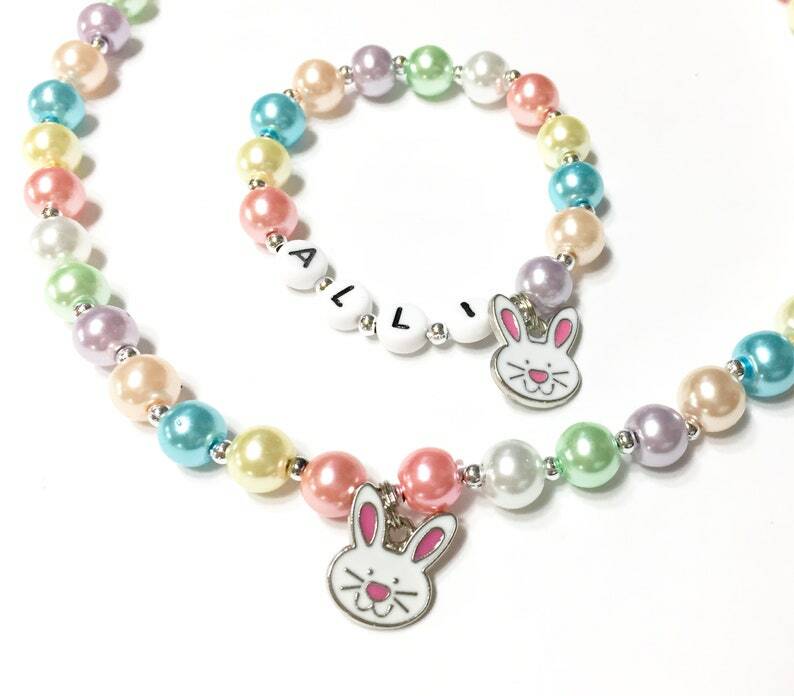 Necklace was so adorable that I ordered a second for my other daughter. Well made, packaged very cute and arrived quickly. Russian Stacking Matryoshka doll charm pin. 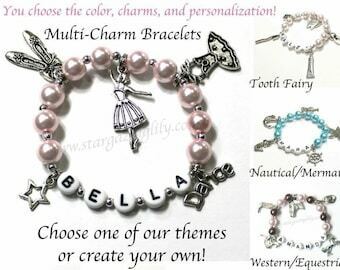 CREATE YOUR OWN You choose 5 charms or birthstone bead and initial bead. Very cute! My girls will love it! How do I personalize my order? How do I tell you the charm choice and colors desired? At checkout there is a notes box. Please include the personalization and customization desired in that box. If you need more than one item be sure to add them both to your cart and checkout only once. That way the combined shipping rate will automatically calculate. 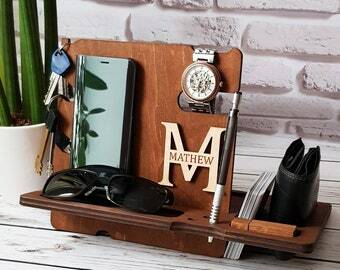 There is just one "notes" box so all personalizations would go in that one box. 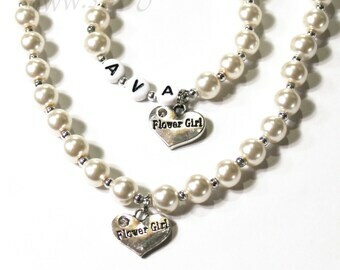 You can visit our blog at the link below for our pearl color chart and pictures of our charm choices. **NOTE Charms marked as "premium" will cost a little more. Our sizing for bracelets is as follows. When you add the item to your cart you will be prompted to choose a size. If the item is for a child and they are average size, our ages below should work for you. Avg. ladies size is 7 1/4"
Avg. mens size is 8 1/4"
2 yo = 5 1/2"
7-11 yo = 6 1/4"
Current turn around time on most items is 3-5 business days. There are some exceptions, shorter and longer. Each time should have he turnaround time noted. The above shipping time are not guaranteed by USPS but usually arrive within these time frames. Express Guaranteed is 1-2 days within the US and this shipping method is a guaranteed delivery time within the US. We're always happy to work with your time line. If you are concerned about your limited time send us a message with the item desired, quantity desired, when you need it to arrive, and where are you located. 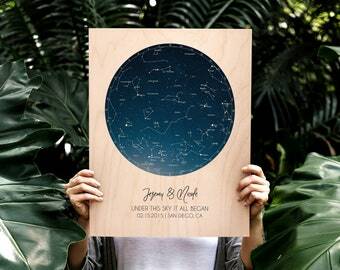 Do I need a custom listing to have a different name put on the item than what is pictured? There is no need for a custom listing. Please purchase the original item and include name desired in the send note t o seller box at checkout. If you need more than one item be sure to add everything to your cart and checkout only once. That way the combined shipping rate will automatically calculate. There is just one "notes" box so all personalizations would go in that one box. I am interested in this item as a party favor. Do you offer a large order discount? Yes, we do offer discounts on large non-rush orders. When you order these as party favors, they all come individually packaged and ready for giving. The guest of honor will also receive a free gift. When you are ready to order please send the following information IN A MESSAGE TO US and we will set up a reserved listing for a single item to purchase for you. Shipping within the US is just $6.50 for the entire order IF we set up the single listing for you. I am placing a large order. Do you offer a discount? Yes! Please feel free to use the coupon code: BULKORDER10 for 10% off your entire order of 10 or more items. How does this come packaged? Upgraded gift packaging is available at the link below. Our standard free packaging is an organza drawstring bag and sparkly tissue paper. What is your policy if my item arrives with an error or not as I expected? If you didn't receive your item as expected or requested? Please contact us before leaving neutral or negative feedback or less than 5 stars. Your satisfaction is our #1 priority. Send us a message, we're happy to work with you! Can I return my personalized order? We have to disassemble each piece. Buyers are responsible for return shipping costs. 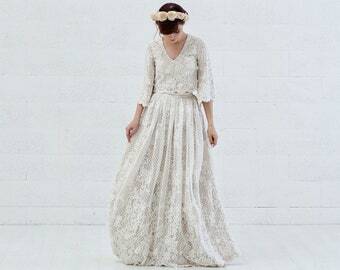 If the item is not returned in its original condition, the buyer is responsible for any loss in value. Can I return my earrings? We do not accept returns on pierced earrings for hygienic reasons. We will accept returns on clip-on's.